As we work on the content and design for the upcoming Monthly Email Update, we spoke with faculty about the PI Dashboard. As a result of those discussions, we've refined the way the Spending Trend graph displays data. Those changes are part of the June 2017 release. Added a month to the display to allow transactions that clear in the month the account closes to appear. Adjusted data display to eliminate "sawtooth" effect when accounts open and close over the life of a project. 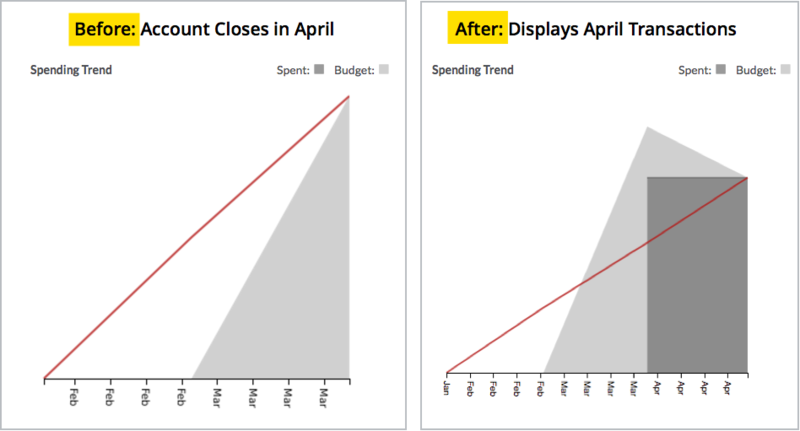 We also renamed this section from Burn Graph to Spending Trend to improve overall clarity. Project Names are entirely visible on the Finances page. Prior to this release, project names were displayed based on a character count, which resulted in some names being cut off along the left edge of the display. The dashboard has been updated so that names are now displayed properly. A small, but useful change now correctly capitalizes RNA and DNA in project titles. See the Before and After below.